There’s a popular Mormon doctrine that describes the future of the soul. It’s always called the Plan of Salvation. Teachers present it so often that I have wondered what made it so important. 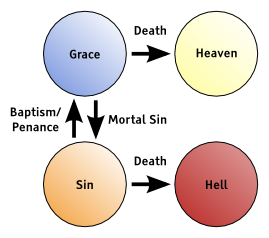 People wouldn’t accidentally find themselves in Hell just because they forgot the order in the diagram. 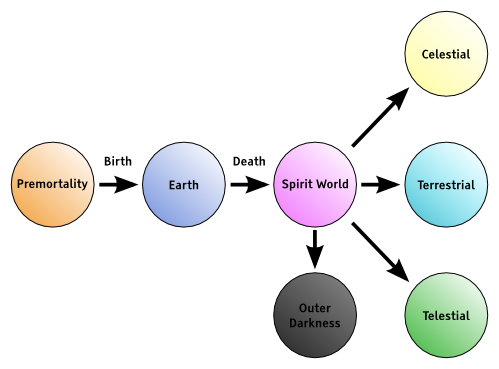 If you wanted, you could draw a similar diagram that represents the plan as taught by other religions. The following is a Catholic chart of the Plan of Salvation. The soul must attain a state of grace, and then it is destined to go to Heaven when it dies. A soul that dies in a state of sin will go to Hell. 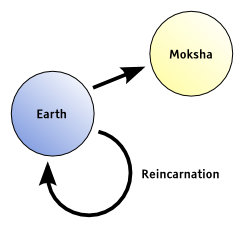 Along the same lines, the following is a simplified Hindu chart of the Plan of Salvation. The soul, which has always existed, reincarnates over and over, achieving higher stations in life, until attaining Moksha, which is liberation and oneness with Brahman. Now permit me to follow a tangent. Each of those three religions has their own works of scripture, just as they have their own ways of choosing scripture. The Hindu canon contains an assortment of ancient texts, including a sacred body called the Smriti. An example of one of those works is the Bhagavad Gita. The present form of the Gita was the result of many revisions. Wikipedia says, “The entire epic went through a lengthy process of accumulation and redaction during roughly the 5th century BCE to the 5th century CE.” Eventually the revisions were complete, and the Gita is now believed to contain eternal truth. Other Hindu texts, such as the Puranas, were also incrementally refined over several centuries. In the Catholic Church, doctrines are decreed by the Pope, sometimes after a decision by an Ecumenical Council. Such decrees are infallible. 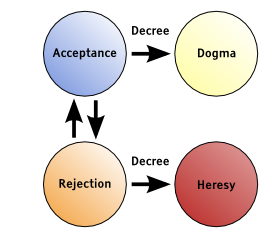 Anyone who doesn’t accept the dogma is a heretic and is subject to punishment. Before an official decree, the doctrines may be debated, but after a decree there is no more room for doubt. The Mormon way to find truth involves personal communion with the Holy Ghost. A sermon in Alma 32 described how truths are learned through experimentation. By the results of the experiment, one can find different degrees of enlightenment. First, a truth that is part of the Gospel is a saving truth. Second, a piece of good advice that is not Gospel is less important, but is still an honorable truth. Third, a mere fact that has no saving power is what I call a trivial truth. Last, we occasionally encounter a falsehood, which is a complete lack of truth. All truth is independent in that sphere in which God has placed it, to act for itself, as all intelligence also; otherwise there is no existence. To take this analogy a little further, it seems that Judgement eventually comes both to truths and to souls. Mormonism holds that some truths are fundamental, saving truths. Those become stepping stones for learning more truths, and so on forever. Likewise, Mormonism holds that righteous souls live forever in the Celestial Kingdom and enjoy eternal increase. There lies the answer to my question about why the Plan of Salvation is taught so prominently: it is a roadmap for finding the truth. Religions teach their respective Plans of Salvation as a subtle tool to help people internalize the rules for judging truth. Because of that, the diagrams don’t merely explain what happens after death, because the diagrams also change the way people view everyone and every idea around them. Teaching about ideas by allegorically teaching about heaven is rhetorically more effective than teaching about ideas directly. The Plan of Salvation is one of the most powerful teachings for altering behavior, in any religion. It’s curious that symbolically our souls and our ideas share so much in common. I wonder if that means that we should consider our own lives to be embodiments of eternal truths. A person’s actions are expressions of that person’s individual truth. The influence of a person’s life proves the power of that truth. Such a truth would be too complex to define in a single sentence, but it could be defined by an entire life’s work. Each person’s truth would be unique, although it would be related to surrounding truths. Honesty and integrity could be defined by how faithful a person’s actions are to their essential truth. Wouldn’t it be interesting if your entire life represented one grand truth? What if the purpose of your life were to learn what that truth is, and to live by it? I remember us having a similar discussion about truth on the way back to Seattle from a hike in the mountains in 2001. Too bad we live too far and are too busy with life to have those conversations anymore! Appreciating the persistence you put into your blog and detailed information which you provide. Thank you for one marvelous posting! I enjoyed reading it you are a fantastic author.I will be certain to bookmark your blog and might come back someday. I would like to encourage that you keep your great articles, have a wonderful weekend!